Lost for almost a century, “Susan and the Mermaid” is the rediscovered tale of a magic ring, an underwater kingdom, and a wise old woman who knew how to make her granddaughter’s dreams come true. 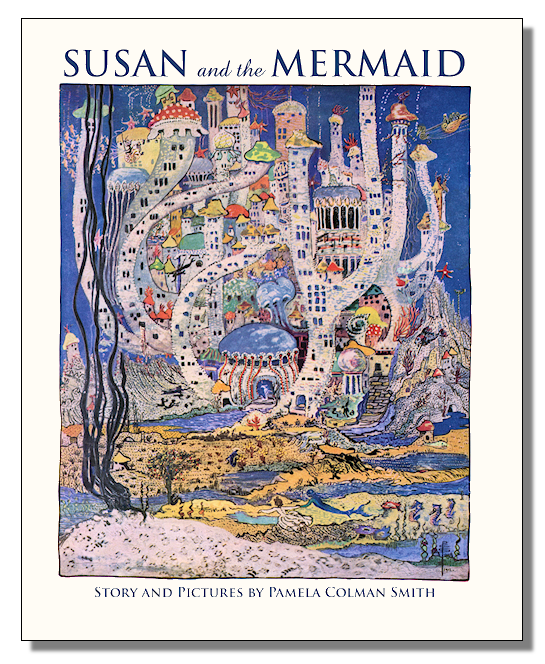 It’s a tale that rivals “Alice in Wonderland” for imagination … and it was written and illustrated by Pamela Colman Smith, whose own life story reads like a work of fiction. Smith published three books by the time she was twenty, and her work won critical acclaim around the world. True fame and fortune eluded her, though, and she died virtually unknown in 1951. Twenty years after her death, however, an old card deck she created was republished, and millions of modern tarot enthusiasts were welcomed into Smith’s world of magic, mystery, and metaphysics. “Susan and the Mermaid” offers a new and unexpected glimpse into that realm, where the border between reality and fantasy blurs, and ethereal creatures lead ordinary people into extraordinary adventures. This story first appeared in the Christmas 1912 edition of “The Delineator,” a magazine for mothers and their children. This version reproduces the original text and images, just as they looked at the time. This book also takes the discovery a step further, by offering a close-up look at the dozens of full-color illustrations Smith painted to accompany the story. “Susan and the Mermaid” is a treasure recovered from the vaults of history. It’s a gift from the past, from an artist who lives on in the words and pictures she left behind.